Money can only buy happiness up to a point. But just how much you need to get to that threshold really depends on where you live, according to a new analysis by Doug Short, vice president of research at investment group Advisor Perspectives. Short's analysis found that if you live in a place like Hawaii, where the cost of living is relatively high, a household needs to make $122,175 per year before some extra cash doesn't really translate into more happiness. In Mississippi, by comparison, the threshold at which more money stops making you happier is a lot lower: $65,850 per year. 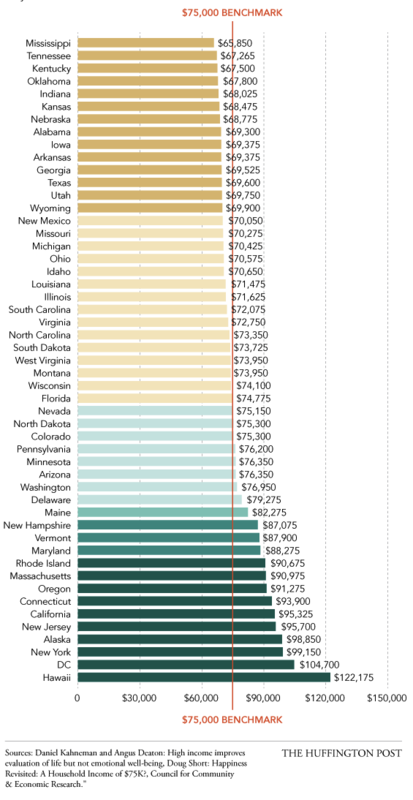 How much money do you need to make in your state before more money doesn't really make you all that happier? We created a map so you could find out. Short, who is not related to the author of this story, relied on a 2010 Princeton study by Daniel Kahneman and Angus Deaton, which found that at the national level, making more than $75,000 per year won't significantly improve your day-to-day happiness. 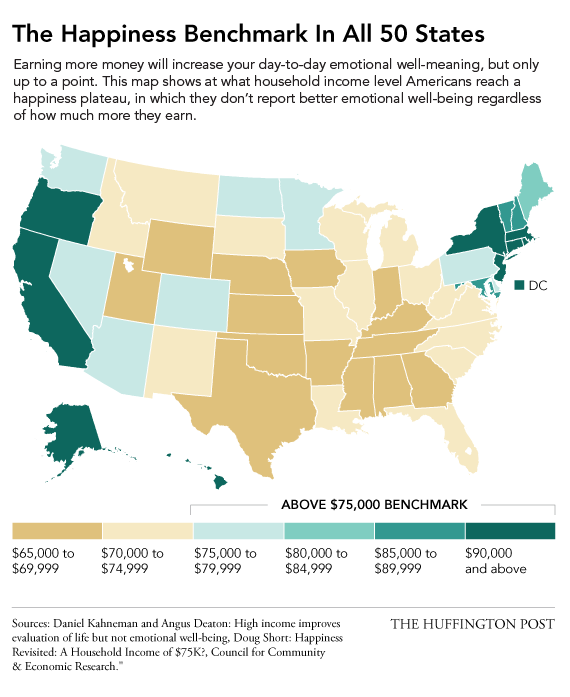 To create his state-by-state comparison, Short adjusted this so-called national $75,000 "happiness benchmark" to reflect the cost of living in each state, relying on data from the Council for Community and Economic Research. According to the researchers behind the original Princeton study, your emotional well-being -- or the pleasure you derive from day-to-day experiences -- doesn't get any better after your household is earning roughly $75,000. That said, a term they call "life evaluation" -- or how you feel about your life and accomplishments -- can continue to rise with higher income and education levels. Of course, an array of other factors (for instance, the number of kids you have, the amount of debt you carry, the cost of living in your city or town) will affect how your income translates to your day-to-day happiness. But that's another conversation altogether. CORRECTION: An earlier version of this post implied that the research was based on one's individual salary. In fact, it's based on a household's income.